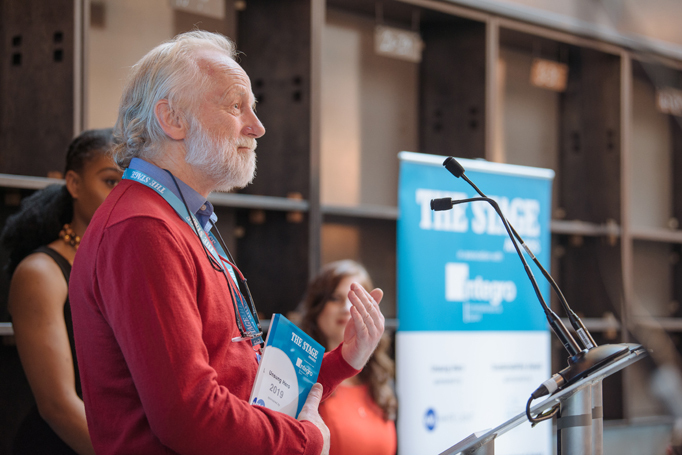 We are in the middle, once again, of the theatre awards season: last Friday this publication held its own annual The Stage Awards at the Bridge Theatre, recognising key venues, producers and training institutions across the UK and beyond. Earlier this week the Critics’ Circle Theatre Awards were held at the Prince of Wales Theatre, and this Sunday the Off West End Awards will take place in the newly revamped Grand Hall at BAC, itself the recipient of The Stage Award for Theatre Building of the Year. Of course, life and the theatre shouldn’t necessarily be a competition; but it’s also nice to have accomplishments recognised, especially formally and publicly and each of these awards celebrates excellence in different ways. One of the nicest of all the awards is The Stage’s Unsung Hero award, which recognises a behind-the-scenes worker who has devoted their life to a theatre. This year’s winner is Pat Nelder, who has worked in various capacities at Theatr Clwyd for the last 42 years since joining the theatre as a junior technician. I’m sure he didn’t need an award to know how valued and loved he is. But, to see him beaming at the awards ceremony, in front of an audience of the great and good of British theatre, was to recognise that it’s not just the big names that make up a theatre and present its public face, but also the loyal throngs who work behind the scenes. At a place such as Clwyd, part of the joy of visiting the theatre is the sense of community you feel all around: from the staff to the audience. As a critic, I always enjoy seeing their long-serving press officer Anthony Timothy. Once, when I needed to get from a matinee at Clwyd to an evening performance in Manchester, the train connection (which has to be taken from Chester) rendered the timings impossible. Anthony drove me all the way to Manchester himself. But that’s what many people who work in theatres do: they go above and beyond the call of duty. Critics are our own ecosystem and community within the theatre; and one of the enduring joys of the Critics’ Circle Theatre Awards, which have been in existence since 1982, is that they allow critics to present a welcoming public face to the practitioners whose work gives us work. They can put a name to (some of) our faces. Any sense of past hostilities and grievances can be put aside as we come not to criticise shows, and the people who make them, but to reward them. I’ve presided over the awards as chairman of the drama section for the last nine years, and it has been a proud honour. I’ve now handed over the chair to Henry Hitchings, as I become president of the Critics’ Circle for a two-year term, which has a membership of nearly 500 professional writers about theatre, film, music, dance, visual arts and literature. The theatre section of the Circle was the founding section of the organisation when it was formed in 1913 and we’re still here – voices speaking up loudly and clearly for the importance of the arts we write about, in ever-challenging times. It was also good to see some genuine diversity among the ranks of the winners of both The Stage Awards and the Critics’ Circle Theatre Awards. At The Stage Awards, there were wins for Hijinx, a Cardiff-based theatre company that works with artists with learning disabilities, and for Open Door, an initiative that helps young people from low-income households prepare and apply for drama schools. Meanwhile, the Critics’ Circle celebrated Natasha Gordon with the most promising playwright award– making history as the first black female British playwright to get a play in the West End with Nine Night – and Sophie Okonedo for best Shakespearean performance for Antony and Cleopatra. The membership of the Critics’ Circle also needs to become more diverse; and this is something I want to take active steps to change during my tenure as president.